Keystone Koating may have a small role in helping the Dallas Cowboys complete a different type of touchdown this season. When the helicopter pilot for owner Jerry Jones makes a landing, his touchdown will take place on a Helicopter Handler. The handler is a steel frame dolly that moves aircrafts in and out of their hangars easily. Main Line Helicopter LLC, created the giant metal dolly, called a Super Handler. PBZ LLC in Lititz helps manufacture them and the metal manufacturer works hand in hand with Keystone Koating, located next door to PBZ LLC. The helicopter, painted in a Sherwin Williams blue paint, (not to be confused with Sherman Williams of Cowboys Hall of Fame) had to match the handler. Keystone Koating offers color matching in partnership with one of their powder vendors. It was able to provide the right blue to cover the 16 ft X 18 ft X 25 inch Super Handler. Powder coating is baked onto the metal part, which forms a thicker layer of protection that is stronger and more weather-resistant. Powder coating minimizes scratching, peeling and fading. The Dallas Cowboy “silver” is seen with the reflective tape on the trailer. The dolly was shipped in two parts. 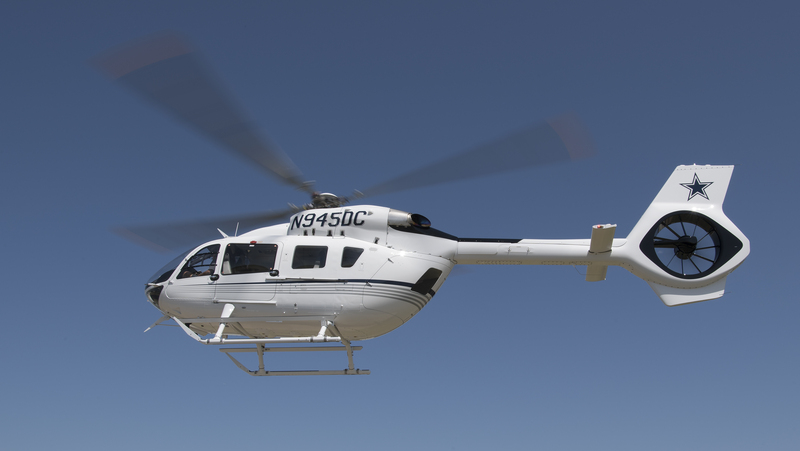 Main Line Helicopter LLC says the Super Handler will help move the team’s new AirBus H-145 in and out of its hangar. Main Line Helicopter LLC serves customers in law enforcement and government agencies, as well as those in the private sector and emergency services.